The modern day road warrior has plenty of things to think about – considering the number of gadgets and gizmos that they carry around, one would also need to prepare the range of chargers on one’s travels. Forget one charger and you might be in trouble, especially if you are in a country or location that is difficult to find a substitute. With the $79.95 Smartphone Charging Wallet, however, you might not find yourself in such a difficult situation if your memory fails you. 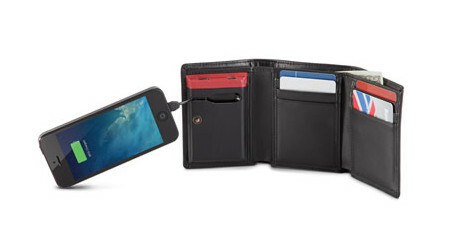 The Smartphone Charging Wallet is a leather wallet that will be able to juice up your smartphone regardless of where you are in the world. This trifold wallet sports a 680 mAh rechargeable battery that has been specially integrated into one panel, where it is capable of providing up to two hours of additional talk time without having to have access to a traditional power outlet. It is made out of genuine calfskin, allowing the wallet to resist the wear and tear of everyday use, without being hard at all. Half a dozen interior slots will be able to hold up to nine cards, where there is also a full-length bill compartment to carry all of your Benjamins. The battery itself will be able to recharge in 30 minutes using a micro-USB adapter, where you will need to choose between iPhone and Android compatible models.